Fidel Gastro: Why Did I Eat This? 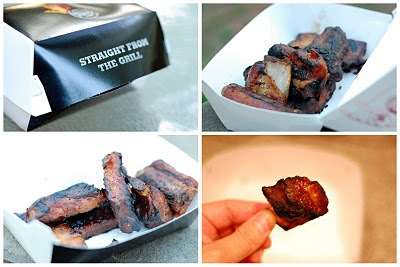 I have no idea how they did it, but Burger King has managed to transform hot dog meat into something that resembles ribs, complete with a bone. No mention of them on the consumer website (yet), but I tracked down a press release claiming that their ability to bring "authentic" bone-in ribs to market is due to "proprietary cooking technology." So how does this cooking technology taste? Imagine a hot dog marinated in liquid smoke, then burnt beyond recognition. In other words, just like the turkey leg at Disneyworld, but somewhat easier to eat. Not surprisingly, the mad scientists came real close to recreating the charcoal flavor, but it wasn't enough to mask the disappointing flavor of the rib meat. With a hefty price tag of $8.20 for a value meal that includes a half-dozen ribs, you're better off ordering from your local Chinese fast food joint with the bulletproof glass and the lunch specials that you can get at any hour of the day. Buen provecho. I have been wanting to try these for the past week. About what I expected. Good looking out!